I've never had a subscription box service, even though I love the idea behind them. It's a little surprise to yourself every month, geared toward things you know you like. The problem I keep running into, though, is that even though there are thousands of subscription services out there, for everything from bacon and beard grooming, to horror movies and comic books, I've never come across something that grabbed me by the shoulders and yelled, "Come on, we're going on a goddamn adventure!" At least, not until I stumbled across Dungeon Crate. What is Dungeon Crate? Well, the simple explanation is that it's a crate subscription service geared toward tabletop gamers. That means when you pop open your monthly package, you'll get dice, set pieces, props, and all sorts of goodies that can kick your games up a notch. The service hadn't launched just yet (at time of writing there's still nearly two days until Dungeon Crate goes live), so I reached out to Wayne Brekke, the Overlord of this enterprise. I asked him some questions, and I wanted to share his answers with you all, in case you were wondering why you should click that link and join up with the Dungeon Crate legion. What are the sorts of things you'd like potential fans to know? We built Dungeon Crate because we are gamers who love the various accessories that come with games. We love dice, tokens, minis, character sheets, and all the things that are out there that enhance role playing games. We thought others would like that too and we are working hard to give subscribers a monthly box that not only is more than worth every penny they spend, but also filled with items they will use on and off the game table. What makes Dungeon Crate different from any other subscription service? We want Dungeon Crate to be the top RPG subscription box available. The fact is, there are thousands of subscription box services, but not a lot that cater to role players and table top gamers. We will offer physical items, digital items, and exclusive items. We’ll also have an online store where folks can purchase items we create. We’re also tapping into the crafting community as it’s huge and both Bill and I are crafters and creators. So many people create terrain, paint minis, and make things to enhance their game, so we will be looking for vendors of things like brushes, paints, tools, and crafting accessories. We have some great ideas that will make Dungeon Crate more than just a sub subscription box service. We want to create a multi-faceted business model that brings together gamers, inspires makers, and showcases other businesses in the gaming community. Who are some of the bigger sponsors you have lined up? We’re really focused on the smaller vendors at the moment. There are so many out there creating awesome gaming accessories. That said we are in talks with some larger vendors and will have announcements in the next few weeks. Right now we are working with Chessex, Shire Post Mint, Arc Knight Games, Knight Watch Games, and a few others. When should people sign up? People can go now and put in their email address to get on our list. We will be launching in a couple weeks and will publish an email to our list letting them know what day and time open enrollment will start. Is this geared toward all gamers, or will certain people get more out of it than others? DMs, players, certain systems, etc? Our goal is to provide a box where every product is used in some way. We are targeting players and DMs, and want to stay system neutral for the most part. 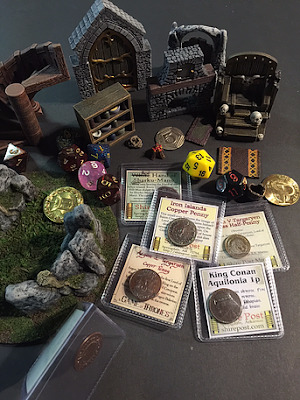 We realize as adults, it’s tough to get players together, so we want Dungeon Crate to be an experience that inspires players and game masters, offering items that will be fun even in between gaming sessions. We’re launching in January. Folks can go to Dungeoncrate.com and get on the list. Our site will be updated soon and we are planning to have an online store, video channel, and great resources for gamers. We’re also looking into an app that will offer easy access to vendors, our store, videos, as well as provide functionalities players and DMs can use in game. More on that to come! Dungeon Crate is a small business and we’ll always be available to our subscribers for feedback, comments, and suggestions. We want to offer the highest customer service and personal experience possible. If that doesn't get your attention, then I don't know what will. Seriously, go check out Dungeon Crate for yourself if you're not sold yet. I guarantee you won't leave without at least bookmarking the page. As always, thanks for popping in to check out my Monday update. If you want to help support me and my blog, just stop by my Patreon page, and pledge as little as $1 a month. Seriously, it helps out more than you know. Also, if you don't want to miss any of my updates, then follow me on Facebook, Tumblr, and Twitter, too.